The Section of Biomagnetism operates a 122-channel magnetoencephalography (MEG) system recording neuromagnetic activity non-invasively with excellent spatio-temporal resolution. The major scientific interests lie in the auditory domain, in pain processing, and psychiatric research. In Heidelberg, hearing research can be traced back until the 19th century, when Helmholtz established his groundbreaking work on the relationship between musical theory and the physiological foundations of perception. Knowledge about the structure and function of the hearing system can be exploited to elaborate theories and models, which are crucial for clinical applications (e. g., objective assessment of peripheral and central hearing impairments). Therefore, the overall aim of the group is to map an auditory processing hierarchy by identifying parallels between psychophysical phenomena (e.g., pitch, timbre, binaural effects), computer simulations, and physiological activity (Andermann J Neurophysiol 2014; Lüddemann Hear Res 2016; Tabas PLoS One 2016). Further, analyzing individual listener characteristics (e.g., age, musicality, or pitch perception preference) allows revealing conjoint effects of nature and nurture in cerebral correlates of human perception (Seither-Preisler J Neurosci 2014). In the field of hearing disorders, the main goal is the identification of neural inhibition or enhancement which are thought to reflect the severity of aversive perceptual phenomena, e.g. tinnitus (Diesch Front Syst Neurosci 2012). The Section’s auditory research projects comprise vivid collaborations with international partners (e.g., Roy D. Patterson, University of Cambridge; Annemarie Seither-Preisler, Universität Graz) and have been funded by DFG, BMBF, and other institutions. With respect to pain, the underlying neural networks are poorly understood. Processing nociceptive signals involves a network of brain areas that has been characterized using neurophysiological and imaging studies; however, cortical evoked potentials/fields or fMRI-based responses have turned out to be less specific with respect to the subjective pain sensation. The SFB 1158 tandem project B05 (Baumgärtner, Draguhn, Rupp) develops spectro-temporal analyses based on non-invasive EEG/MEG-recordings to assess the connectivity between cortical regions and decipher a reliable functional marker of phasic, ongoing and chronic pain. Moreover, in rodents, the recording of multi-cellular and network level activity patterns with high resolution and exact positioning of electrodes in (sub-)cortical structures supports the transfer of findings from mice to humans, and vice versa. This includes the analysis of ensemble activity dynamics carried out in collaboration with Emili Balaguer-Ballester (Computational Neuroscience Lab, Interdisciplinary Neuroscience Research at Bournemouth). Recently, modeling intracerebral sources of scalp-recorded physiological activity has triggered growing interest also in psychiatric research. The respective methods have been utilized in experiments on cortical visual processing in patients with schizophrenia (Müller JAMA 2015), and are now being transferred to other clinical populations, i.e., patients with Borderline personality disorder. Regarding the latter, we are currently establishing a cooperation with the Center for Psychosocial Medicine (General Psychiatry, AG Herpertz/Bertsch), based on a recently submitted research proposal. Regarding future auditory projects, the Section of Biomagnetism intends to investigate developmental aspects in audition, from peripheral structures up to higher cortical regions. The overall aim is to uncover neural coding principles by bridging the gap between physiological findings, perceptual phenomena, and computer models that mirror the multiple hierarchies of auditory processing. In the context of pain research, future work will focus on the neuroplastic changes and the dynamics of pathological processes in chronic models, in order to unravel new aspects of altered brain function in chronic pain patients. Neuromagnetic representation of pain-evoked responses in a single subject. (A) Minimum-norm estimates of laser-evoked fields projected onto the T1-weighted cortex reconstruction. 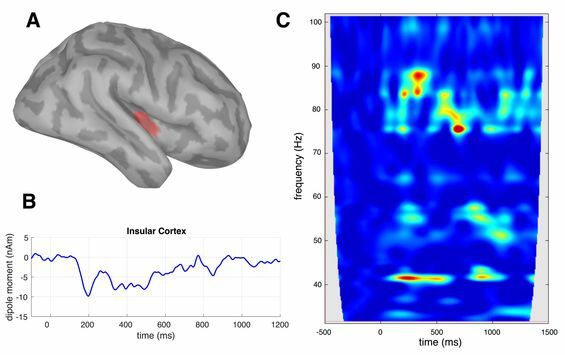 The red area depicts insular cortex activity 158 ms after laser beam onset. (B) Temporal activation of the posterior insular cortex. (C) The additional spectro-temporal analysis of this region exhibits a prominent sustained response in the high-gamma range.